Aroldis Chapman is in the first year of the largest contract ever before awarded to a reliever. Chapman earned that contract for having proven himself as perhaps the most overwhelming one-inning pitcher in the modern history of the sport. Other relievers have been great, sure, but Chapman was something extraordinary. Extraordinary, that is, until a strange thing happened. Around the middle of the summer, Chapman was bad. Perhaps he was bad only by his own standards. He was still throwing his fastball a hundred miles per hour. But Chapman struggled enough to lose his job as the Yankees’ closer. Over one stretch covering a month and a half, Chapman allowed a mediocre .724 OPS, with a strikeout-to-walk ratio well under 2. The arm strength was there, but the results were not, and, that fast, Chapman started to feel unreliable. Aroldis Chapman, of all people. He lost his air of invulnerability. Since September began, Chapman has made 12 appearances. He’s generated two walks and 20 strikeouts, allowing a .250 OPS. Chapman took over Tuesday’s wild-card game after the outcome felt like a foregone conclusion, but he didn’t allow the Twins to open the door. He struck out Robbie Grossman swinging. He struck out Brian Dozier swinging. Joe Mauer managed to fight off a full-count delivery for a ground-ball single the other way, but then Chapman struck out Jorge Polanco swinging. It felt so perfectly normal. Visually, Chapman isn’t a changed man. He’s still a reliever built around his velocity, and this year that velocity hasn’t waned. But there’s no denying the slump that took place. I’d say Chapman first became a true elite reliever in 2012. Going back six years, then, here’s how Chapman’s contact rates have bounced around. 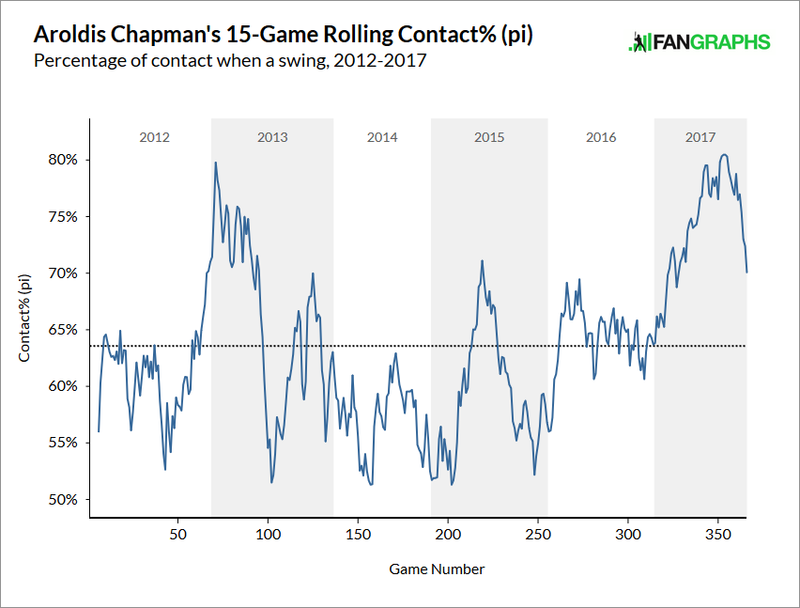 OPS numbers come and go, but looking at contact rates might reveal the truest reflection of how Chapman has been going at any point. When he’s going well, he’s almost unhittable. He’s usually been going well. For a while this past summer, opponents were hitting the ball with the overwhelming majority of their swings. It was an odd thing to witness, but it was very much a thing that was happening, leading to Chapman’s demotion. Only more recently has he apparently turned the corner. Chapman isn’t a fastball-only pitcher, but he is a fastball-first pitcher. So we can look at something related. Going back now just three years, for simplicity, here’s how Chapman’s fastball has performed in terms of generating swinging strikes. What you see is a rolling 100-fastball average. Lately, the whiffs have returned with gusto. This has followed an unusual dip that was unusually sustained. This much, you might’ve already inferred. Chapman was slumping, so it only makes sense that the fastball was most responsible. So what’s the turnaround story? According to Chapman and Larry Rothschild, Chapman changed his fastball grip. His fingers had been going basically along the seams, such that Chapman was throwing something like a two-seamer. The recommended tweak was for Chapman to use the conventional four-seam grip. There are pictures of Chapman holding the ball in the article linked. To investigate quickly, I went to Baseball Savant. 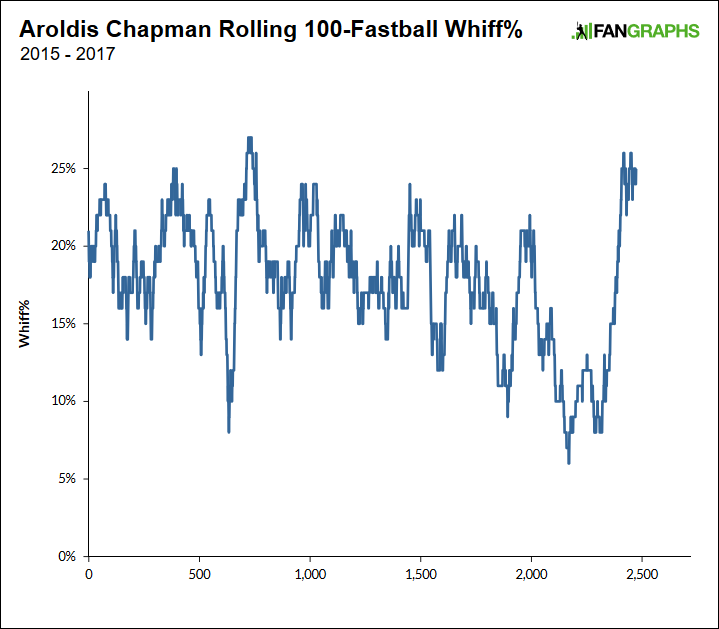 Here’s another rolling-average plot going back to 2015, but this time showing Chapman’s average fastball spin rates. Way I figure, if the fastball was being held differently, it would move and spin differently. Sure enough, something has changed abruptly. 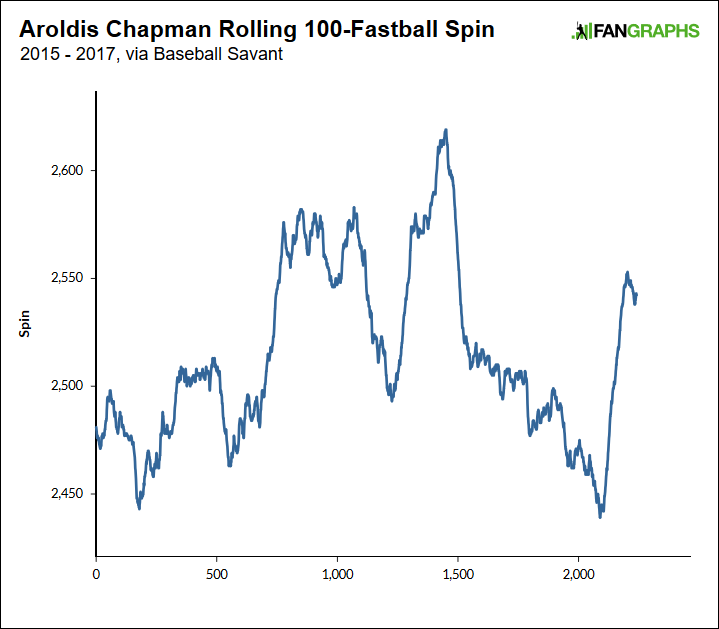 More recently, Chapman’s been getting more spin than he was just before. What’s odd is how the line has moved around. Chapman’s spin has had its ups and downs. Maybe this isn’t the best way of examining the subject at hand. In July and August, Chapman’s fastball averaged about 10 inches of rise. Since the start of September, it’s averaged about 11. There’s been a minor reduction in the average horizontal movement. There are signs in here of change, of adjustment, but it’s all subtle. Chapman has by no means experienced a fastball overhaul. But the story might not be about how the movement has changed. It might simply come down to comfort and command. As Chapman’s fastball has rebounded of late, he’s also thrown it a great deal more often. Chapman has said he feels like he can locate better, and the results would certainly back him up. Of even further interest: When did the two-seamer grip begin in the first place? How did it come about? If the Yankees are to be believed, Chapman was throwing a two-seam fastball in the middle of the summer. Here’s a picture from 2010, with a four-seam grip. Here’s a picture from spring 2016, with a four-seam grip. Here’s a picture from the middle of 2016, with a four-seam grip. Here’s a picture from the end of 2016, with a four-seam grip. As far as I can tell, Chapman always threw a four-seam fastball. It always behaved like a four-seam fastball. How did it morph? I don’t actually have an explanation. Maybe some coach told Chapman to change his grip, but why would Chapman have ever needed to change? Maybe Chapman convinced himself to change his grip, but, the same question applies. Maybe Chapman’s grip just shifted in a two-seamer direction by accident, through inattentiveness or what have you, but what major-league pitcher forgets how to throw the most fundamental of all pitches in existence? If Chapman actually did go through the summer throwing a different kind of fastball, how that began is, to me, an open mystery. Yet the supporting quotes are right there. Maybe it’s all a ruse. Maybe the grip was never the problem at all, but that’s just how they chose to go public. That would be weird. Maybe still not as weird as Chapman ending up throwing a two-seam fastball by mistake (or by *not* mistake). Regardless, the results look normal again, which is to say, they look very much abnormal by ordinary baseball standards. The evidence would suggest that Chapman’s slump is very much behind him, and it’s a wonder one existed at all, given how Chapman never lost his arm strength. If nothing else, you should believe in a player’s true-talent level. Chapman’s has always been elite. He deserved the benefit of the doubt, because of his history, and now it’s all working again. As if the Yankees needed the boost. One takeaway is that Chapman is back. For whatever reason, Chapman is back, and he’s dominant. But another incontestable takeaway is that the summer revealed how narrow the margins are, for even the best among the best. Aroldis Chapman never stopped throwing 100, he never stopped pitching like Aroldis Chapman, yet for several weeks in a row, he was a problem. He was, bizarrely, hittable. All because something, perhaps his fastball grip, was very slightly off. It’s amazing what big leaguers can do when they’re successful. It’s amazing how little can be different when they’re not. If it’s true for Aroldis Chapman, it’s at least just as true for everyone else. We hoped you liked reading So Much for Aroldis Chapman’s Weird Little Slump by Jeff Sullivan! Instead of plotting just spin rate, would you mind plotting spin/mph? We know spin ? mph (Bauer Units etc), and we know Chapman’s mph dropped a bit in August, especially compared to last year, before coming back up. I still think there’s plenty to the grip argument, but why not include the mph when we know if affects spin?